SAN FRANCISCO, CA (May 24, 2010) - The Levi's® brand continues in its tradition of bringing great jeans and great music together with today's launch of Levi's® Pioneer Sessions: The Revival Recordings - a new and innovative campaign that champions musical artists who embody the pioneering spirit of the Levi's® brand. An original series of musical recordings by a diverse roster of talented musicians, Levi's® Pioneer Sessions: The Revival Recordings features remakes of hits from past decades inspired by renowned artists. The first two songs in the series will be released this week - hip hop superstar, Nas, covering "Hey Young World" by hip hop trailblazer Slick Rick and folk rock duo, The Swell Season's rendition of the 70s disco hit, "Young Hearts Run Free" by Candi Staton. Both songs will be available for free download, May 24th and May 27th respectively, at www.levi.com. Details regarding the remaining artists who are going to complete the current roster of releases will be announced in the weeks to come. Now, I suffer greatly from the paranoia that our post-record label music will be controlled by the likes of corporate sponsorship, personal preference potentially playing a discriminatory role in terms of content. Not that I’m one for conspiracy theories, but sponsors are quite fickle when it comes to controversy and the potential loss of revenue that can sometimes follow if associated with controversy. That being said, I’m not so much a fan of music campaigns being funded by brand labels. However, because performers like Nas and bands like The Swell Season, The Shins and The Dirty Projectors are taking part in this project, I figured it was interesting and relevant enough to post about it. 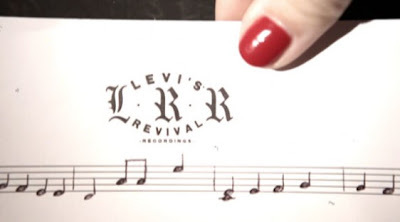 Besides, at the very least, while Levi’s is not necessarily focusing on the most off-kilter of artists, they’re using artists with longevity when it would be easier to go the disposable route and find this week’s flavor to promote their compilation. To find the latest performances go to . The contributions from She & Him, The Swell Season and Nas are available for download.